Ciaran Clark has struggled to get into the Newcastle side, while Shane Duffy has thrived at Brighton. 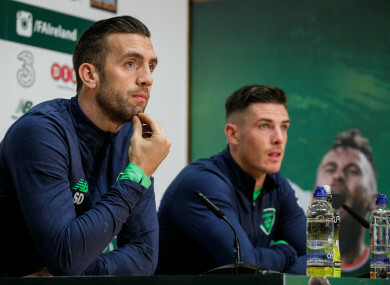 Shane Duffy and Ciaran Clark pictured at Monday's press conference. IF YOU WERE asked to think of candidates for the most impressive Premier League centre-backs at this early stage in the season, Shane Duffy would rank pretty highly. Alongside Lewis Dunk, the Derry native has been hugely impressive at the heart of Brighton’s defence. Last weekend’s 1-0 defeat of Swansea saw the Seagulls go eighth in the English top flight. Aside from the last 17 minutes of the 1-1 draw with Everton, when he went off injured, Duffy has played in every minute of Brighton’s league campaign so far. Chris Hughton’s side have conceded just 11 goals in 11 games — none of the teams below them apart from Newcastle have a better defensive record, while even Arsenal and Liverpool have conceded more. Duffy’s commanding displays have seen him receive acclaim from one individual who knows plenty about the art of defending. Clark, by contrast, has not played as much as he would have liked for Newcastle of late. Although he has featured in eight of Newcastle’s 11 Premier League fixtures, he has only made one appearance for the Magpies since the Ireland-Wales game — coming off the bench in the 1-0 loss to Bournemouth at the weekend (although a bad-looking ankle injury suffered by club captain Jamaal Lascelles could mean Clark gets more game time after the international break). Newcastle manager Rafa Benitez recently offered Clark some encouragement after losing his place in the starting XI, urging himself and fellow second-choice centre-back Chancel Mbemba to fight for their places. “The message to them is the same I have gave to everyone,” Benitez told The Chronicle. “They have to put me under pressure by training and working very hard. They have to be sure that if I have to pick them they have to do well. “Anyone can say I deserve to play but they have to work for it. “Ciaran is quite positive and has been really good in training. I am really pleased with him. Clark is not the only Irish player who is not a regular starter at club level currently, with James McClean, Shane Long and Wes Hoolahan among the stars who have failed to consistently make their respective sides’ starting XIs. Nevertheless, the 28-year-old centre-back feels himself and others can benefit from time spent away on international duty. Everyone looks forward to coming away,” he says. “The players get on really well and all the staff get on well. It’s a good opportunity if it’s not going so well at club level — you’ve got two weeks away. Hopefully, we can gain confidence from this trip — if players are having a tough time at club level, then use that and take it back to club level. “(The Ireland camp is) generally a very happy place to be. Everyone wants to come away and represent their country. Everyone works hard. And while Duffy and Clark’s fortunes at club level may be different of late, the pair have both been outstanding for Ireland in their World Cup qualifying campaign. No one in Group D had a better defensive record than the Boys in Green. Ireland conceded just six goals in 10 games overall, and Duffy and Clark’s contribution is all the more impressive when you consider that Martin O’Neill’s side conceded twice against Serbia, when neither were involved (Duffy has started eight qualifiers overall, with Clark appearing in seven). The pair were particularly impressive in the 1-0 win over Wales in Cardiff, with Duffy being given the man-of-the-match accolade for his immense display. “It was a good defensive performance, but the whole team contributed there,” Clark says. We had to put our bodies on the line,” Duffy adds. “It was ugly, but it was a great feeling to be a part of. Richard Keogh has been ruled out, but Duffy says the presence of other well-regarded centre-backs in the squad — John O’Shea, Kevin Long and Paul McShane — will keep himself and Clark on their toes. “(Ciaran has) been around the Ireland team for a lot longer than me. He’s been great to play alongside. And as impressive as the pair have looked together over the course of this World Cup qualifying campaign, they will face arguably their biggest challenge so far in keeping Denmark’s Christian Eriksen quiet. The 25-year-old has eight goals in his last eight games for the Danes, while he has also scored four for Spurs since the new season began. In addition, he is somewhat of a creativity machine, having come second in the Premier League assists table for the past two seasons on the bounce, according to ESPN’s figures. He’s a fantastic individual player and plays for a brilliant club side,” Clark says. “We’re well aware they’ve got some good individuals. “The staff and players will watch the videos and analyse the way we can prevent him and the other individuals from showing their strengths. Email “Ireland's centre-backs face Denmark on the back of contrasting fortunes at club level”. Feedback on “Ireland's centre-backs face Denmark on the back of contrasting fortunes at club level”.